When watching The Great British menu a few years ago Bryn Williams made Bara Brith for his dessert. This traditional Welsh cake was the first thing that I ordered when we had morning coffee in Little Haven in Pembrokeshire, Wales. It is a spiced fruit cake and really tasty. As soon as we were home I looked through all of my recipe books to find a recipe for Bara Brith. I prefer to use my recipe books as I have paid for them and need to get some use from the recipe book, other than getting the writer to sign them for me. I turned to Brian Turner’s Favourite British Recipes and followed his recipe for Bara Brith (page 175) to the tee, using up the last of my fresh yeast. The first stage worked quite well, given the fact that I had to use my heater to prove the dough as it was a really cold day, but the second stage proved to be a total disaster. A dough did not form with the addition of the liquid ingredients, and instead I had a nice batter. Rather than shaping this into a round tin as per the method listed, I poured the batter into a loaf tin and proceeded to bake it for the required time. This resulted in a not completely cooked spiced loaf, which I cut up and dried into rusks. I then turned to the internet and found this recipe. It worked perfectly, and the Bara Brith lasted a week. We toasted some and had it with jam which was perfect for an afternoon tea time treat. Do you order traditional cakes when you are travelling? I agree re: cookbooks. It’s just too easy to turn to the internet and leave the books languishing on the shelves. Today I’nm having a go at marmalade from an old book that doesn’t even have pictures…. I have faith but time will tell! I am so looking forward to that recipe Fiona! This cake with a little coffee looks like the perfect way to start my day. I don’t order traditional cakes when traveling because I never see such items on the menu, or at least where I travel! Looks delightful though..
this englich bara brith is must try recipe!!! So pleased that others watch The Great British Menu – and this loaf looks great. Beautiful – this bring back happy childhood memories as one of my grandfathers was Welsh and one of my great aunts always used to make this. She used to cut it really thin and spread butter thickly on it! Happy days 🙂 You made a great job of yours and well done for persevering. Hi Tandy, this sounds so interesting, so clever of you to change gears and make the most out of the batter. Looks delicious! I love cake or bread recipes with raisins and tea and spice… this looks and sounds divine! It is awesome and I wonder if you could make GF option? This Welsh cake looks lovely! I’ve never heard of this but it sounds like a great breakfast loaf! Lovely! I will definitely be making this. 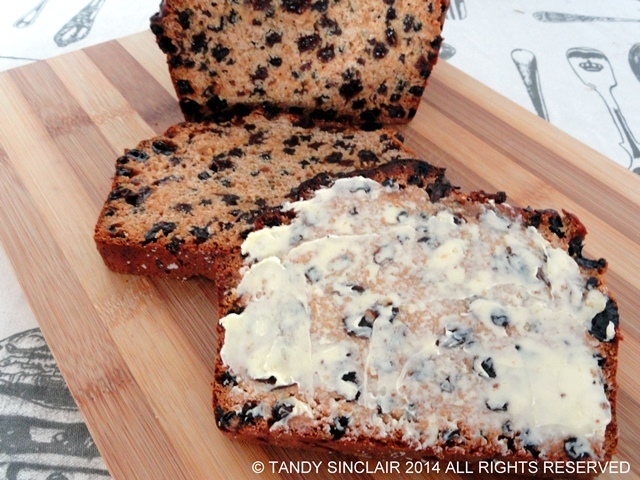 Tandy, a slice of your Bara Brith would be perfect with my morning tea. I do try to eat traditional cakes when traveling…Germany and Austria both have some nice ones. Such an interesting cake, Tandy! Sounds delicious. Yummy. Did you use the same weight of fructose as shown in your recipe?